What’s been your favourite moment of our re-telling of Our Mutual Friend via Twitter? Lady Tippins on the razz? Mr Venus’s crocodile philosophising? Eugene and Mortimer’s bromance? Or the war of words between Bella and Rokesmith? Birkbeck’s Theatre Studies Master’s students will be creating a special performance piece incorporating some of our favourite OMF Tweets, which will be performed at a celebratory event at the end of the year, when we reach the novel’s conclusion. So, please let us know what your favourite moments have been and you may see them adapted and performed! On this day in 1865, Dickens, Ellen Ternan and her mother, Frances Ternan, were involved in the Staplehurst railway crash, when occurred when a South-Eastern Railway train from Folkestone to London derailed while crossing a viaduct. 10 people were killed and around 40 injured. The crash was caused by human error, as workmen who were replacing the track misread the timetable. Mr. and Mrs. Boffin (in their manuscript dress of receiving Mr. and Mrs. Lammle at breakfast) were on the South-Eastern Railway with me, in a terribly destructive accident. When I had done what I could to help others, I climbed back into my carriage—nearly turned over a viaduct, and caught aslant upon the turn—to extricate the worthy couple. They were much soiled, but otherwise unhurt […]. 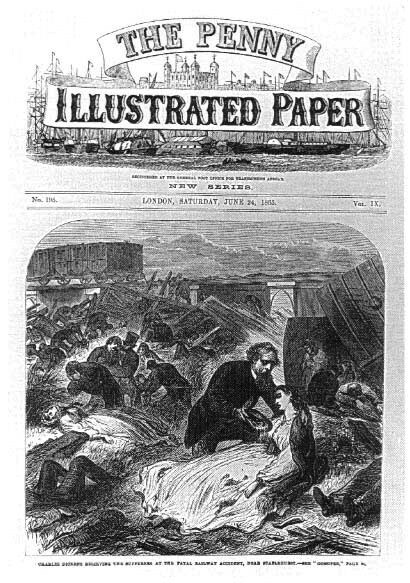 Dickens famously tended the wounded and dying at the scene of the crash, as illustrated, with wonderful melodramatic intensity, on the front cover of the Penny Illustrated Paper. The playwright Simon Gray posited, in his play Little Nell, that Dickens’s disavowal of Nelly and her mother at the scene of the crash to avoid a scandal was a later source of tension between the couple, although this is entirely undocumented. Dickens was greatly affected by the crash and suffered a series of debilitating symptoms, including losing his voice immediately after the crash, that suggest post-traumatic stress. Dickens died five years to the day after the accident and it certainly seems to have contributed to his declining health at the end of his life. For the next event of the summer term we are very excited to host a panel on ‘Adapting “Our Mutual Friend” for TV and Radio’, featuring Sandy Welch (screenwriter of the 1998 BBC TV adaptation), Mike Walker (writer of the 2010 BBC R4 adaptation), and Jeremy Mortimer (producer of the 2010 BBC R4 adaptation). This event will take place on Thursday 4th June from 6.00-8.00pm in the Birkbeck Cinema, Birkbeck School of Arts. You can find more more information and see our full summer term programme here.